Are you thinking about investing, but aren’t sure the stock market is your best bet? Here are 10 interesting alternatives to the stock market. A recent study revealed that 30% of Americans feel stressed continuously about money. Where do you fall into that statistic? Are you worried about your net worth (or lack thereof)? While the stock market is a great way to grow wealth and improve your financial security, it’s certainly not the only strategy. In fact, diversifying your assets in various investments can safeguard you from financial distress. 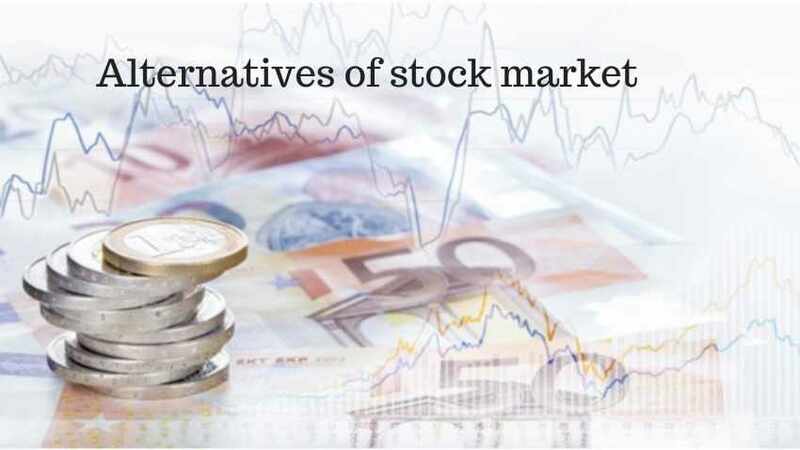 Let’s get into the top alternatives to the stock market. Although it’s a relatively new phenomenon in modern society, peer-to-peer lending has been a dynamic strategy for many successful investors. The premise is simple and straightforward. Online services offer various loans to businesses or individuals. Once the borrower qualifies for the loan, people like you fund the money (as opposed to a traditional bank). In other words, you join a pool of other like-minded investments willing to loan money for a specific project. With that in mind, the rates you can accrue are typically excellent. As in, people yield returns over 10%. You also receive a set payment every month that includes your owed interest. Naturally, the risk is that you are loaning money to people who may not be able to get you the money back. These people may be more ‘at-risk’ than those who traditionally go through a bank. As we continue to move more into a ‘shared economy,’ experts believe that we will continue to go to each other (rather than traditional banks) for financial lending. Real estate is one of the fastest and most effective ways to grow profound wealth. Moreover, the possibilities to break into real estate are endless, as you can look into multi-family homes, duplexes, single-family houses, and commercial buildings. The returns tend to be high simply because you don’t have to pay fully for the property upfront. Instead, you make your down payment, receive the bank financing, and enjoy the rental income. Real estate also comes with many generous tax breaks that can further increase your financial situation. Obviously, real estate does require time and dedication. There’s no doubt that Being a landlord can be tough work. You’ll have to deal with different tenants and potential, middle-of-the-night emergencies. With that said, everyone needs a place to live, and businesses all need a place for operation. That means that real estate will continue to dominate as an excellent choice for both expert and novice investors. If you don’t like the idea of being a hands-on landlord, you can always hire a property management company. They’ll manage most of the daily work for you for a small percentage of your profits. Have entrepreneurial dreams? You’re not alone. In fact, there are over 30 million small businesses in the United States. Starting your own business can feel scary and overwhelming, but it can also be incredibly rewarding both emotionally and financially. You’ll need to identify a viable solution to a common concern or question your potential customers will have. You’ll also need to research your competition and your budget potential thoroughly. All business plans require upfront investments, but if you are also working a steady job, you won’t have to surrender your security. Furthermore, because you can start so many different types of businesses online, you won’t need to break the bank to start creating your vision. However, if your business does succeed, you can make a killing on your ROI. Gold represents a tangible, liquid asset that exhibits long-term value. It’s a strong competitor to stocks and offers useful diversification. In difficult economic times, gold has been proven as a secure investment choice. Even if you choose to invest conventionally in the stock market, many expert investors recommend holding a small allocation of gold within your portfolio for diversification. Unless you’ve been living under a rock, you’ve definitely heard about the cryptocurrency explosion in recent months. From Bitcoin to Ethreum to Litecoin, there has been significant attention on the changing tide of how blockchain drives our economic horizon. Many companies utilize high-tech applications and technology to easily invest. In fact, you can even completely automate your trading with a tool like a binance trading bot. Just like with any investment option, it’s important to stay focused on the long-term benefits. While cryptocurrency tends to have dramatic price swings, it’s important to disregard the volatility and commit to the long-term gains over several years. This is the investment choice you’ve probably never heard of, but you’re not alone. When you own a home, you pay property taxes to your city. These taxes pay for the basic resources and operating of your neighborhood. If you don’t pay your taxes on time, you receive a penalty interest rate. However, let’s say you live in an area where people don’t get around to paying their taxes on time. The town receives its late payment interest, but they still need the money now to fund their necessary expenses. If enough citizens don’t pay their property tax on time, how does the city fairly pay its employees? Some counties hold auctions to sell tax liens to investors. As an investor, you would be responsible for fully paying the lien. Then, you’d collect the interest payments. You’re gaining a small profit, and your town still operates. It’s a win-win for everyone. It’s similar to real estate but also operates as a business. Many investors look at farmland for its sustainable and profitable resources. That’s because farmland can consistently drive a profit. Some investors engage in the farming process themselves. Others choose to lease or outsource it to another company. Regardless, you will enjoy the cash flow benefits generated from the land. In fact, research shows that farmland has yielded an annual return of 7.09% since 1990. That’s comparable to the stock market. Furthermore, annual cropland and individual crops on the property can yield their own returns if you are using them for production. Some local private businesses offer the ability to invest in their business. They typically offer this option when they want to expand their operations or increase their capital. Obviously, they need money to achieve this. If you want to invest in a business, you don’t necessarily have to find one that is publicly traded. You can instead find a local startup or small business looking for additional funds. This can be a great way to productively grow your money, especially if you have a personal and vested interest in the company’s niche. Did you know that some paintings can auction off for several million dollars? Collecting and selling art doesn’t just have to be for the experts, either. Ordinary people utilize this collection option as a viable investment source. Furthermore, this investment opportunity serves two purposes. On the one hand, you can create a future income stream. On the other hand, you can enjoy the lovely art and collectibles in your own home now. Even though it’s not the most well-known option, leasing equipment can be a successful investment opportunity. Consider this. You go to the doctor or dentist on a routine basis, right? Think about all those machines and equipment they have in their offices. As it turns out, most professionals can’t afford to buy their equipment outright once completing school. They’re usually bogged down by student loans and other debts. Instead, they turn to equipment leasers to finance their necessary equipment. This investment opportunity requires research and time. You’ll need to know how the equipment works, who will need to use it, and how much profit you can generate. Otherwise, you risk getting stuck with a large piece of equipment with no real purpose. Successful investors know how vital it is to diversify their assets. They also know that considering alternatives to the stock market can generate some really sweet financial rewards. Take the time to do your research. You may need to engage in a trial-and-error process before finding what works for you. Here’s to happy investing in all shapes and forms! How do you diversify your assets? Have any cool investment stories you’d like to share? Drop a comment below!